Ever since early-2017, our theory has been that multiple years of monumental Quantitative Easing / Negative Interest Rate monetary policies affected the behavioral patterns of investors and changed the structure itself of the market, in what accounts as self-amplifying positive feedback loops. 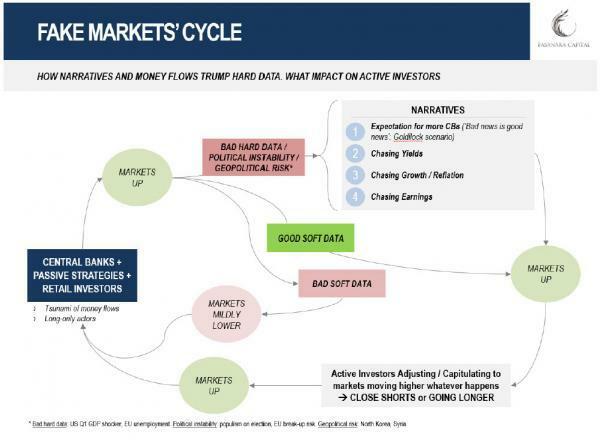 Fake markets, where artificial money flows killed data dependency, affected market functioning and changed the structure itself of the market (May 2017). We focus on largest ETFs and largest Asset Managers as we believe them to be the cracks in the financial system, the fault lines that lead to market fragility, hence our focus on them as a meaningful proxy for the broader financial market. The analysis that follows is powered by our Fasanara Analytics team, a proud addition to the Fasanara family of late. It is not intended to be a finished product, but rather a work-in-progress, along the way of truth-seeking data mining. Any feedback/critique, please reach out, happy to collaborate and incorporate. Our analysis framework borrows from complexity theory and network modelling, we investigate phase transition from one state of the market to another by applying ideas from earthquakes prediction, information theory and pure mathematics. We model the market as a network of agents (the nodes of the figure below) whose strength of interaction (edges, distance) is computed using a non-linear transformation of the pairwise correlations; for details on the network construction please see Onnela et al. 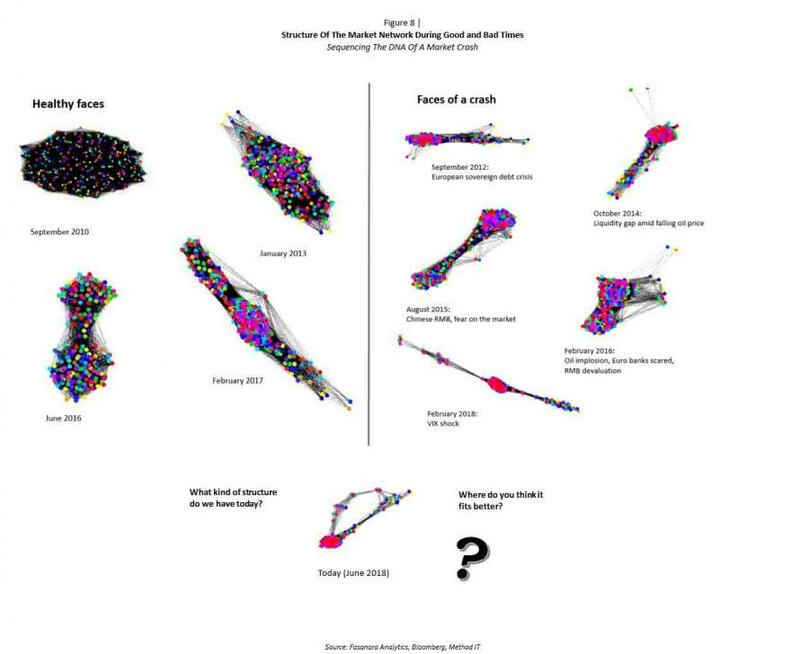 “Dynamics of market correlations: Taxonomy and portfolio analysis”. We provide a visualisation of the market structure as modelled by a graph where each node represents an ETF, and the length of the edge represents the strength of interaction (inversely proportional). Please note the density/crowding of the nodes (market concentration) in September 2008, and how it looks after the pressure is released, in the healthier conditions of 2010. The stiffness of the market increases again after 2015, leading to a current situation of high density and potential danger as the market is no longer able to absorb shocks. All in all, we observe signals that a phase transition in the passive investment industry might be approaching, as shown by our analysis of the Asset Management and ETFs segments of the industry, which give similar results. When coupled with their size, and the tight ties with financial markets at large, we believe systemic risk are at or close to the cliff, ready to transition. Similar levels of fragility, as defined and measured in this paper, were visible in the most recent proper crash of 2007/2008. How does a crashing market looks like in terms of market structure? Here below we pit the healthy faces of the market, in peaceful blue-sky environments, against the ugly faces revealed during periods of stress. One big annotation: no truly meaningful crash occurred ever since the Lehman-moment. Here we only see timid, tepid, shallow, fleeting market sell-offs. None of them lasted, if anything they got more and more irrelevant over the years as the buy-the-dip mentality compounded. Most importantly, none of them look even remotely like the one we expect in the not-so-distant future for markets. Still, they can be analyzed as ‘small-scale rehearsals’ for the Big One approaching, and certain general properties of their structure can be learned. Where does the current market structure belong? It may belong to the list on the right, the ugly faces of the market in the midst of a stress period. With one notable difference: there is no crash today. Today’s market structure looks like the market structures visible during flash crashes, without being in one. It may be yet another signpost, in a long list of early warning signals, that the market system is full, stationing on paper-thin ice, ready to transition. 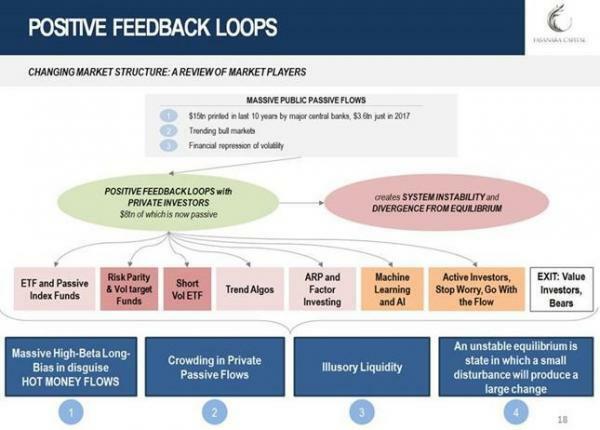 As background material of our ‘Critical Transformation Hypothesis’ for global markets, this note further analyses the structure of the market, and how it weakened under the force of positive feedback loops between public flows and the private investment community. We looked at largest asset managers and largest ETFs globally as a meaningful proxy for the broader financial system, as we think they represent the weakest links in the market lithosphere. We find that, over recent years, measures of market diversity fell in lockstep with measures of entropy, all the while as concentration rose to record levels. Entropy in the ETFs market decayed at an average rate of 4.5% per year in the last ten years, and its trend-line has almost reached 2008 levels. Measured as ‘’average closeness centrality’’, concentration in the ETF market increased by a striking 12.1% year-on-year since 2008, and its trend-line reached levels only seen in 2008. Looking at systemic risk through the lens of complexity theory, we attempt a visualization of how the market structure on passive ETFs evolved over time. We visualized how the market structure weakened progressively over the last ten years, becoming more concentrated, entropic-fragile, and ready to snap. 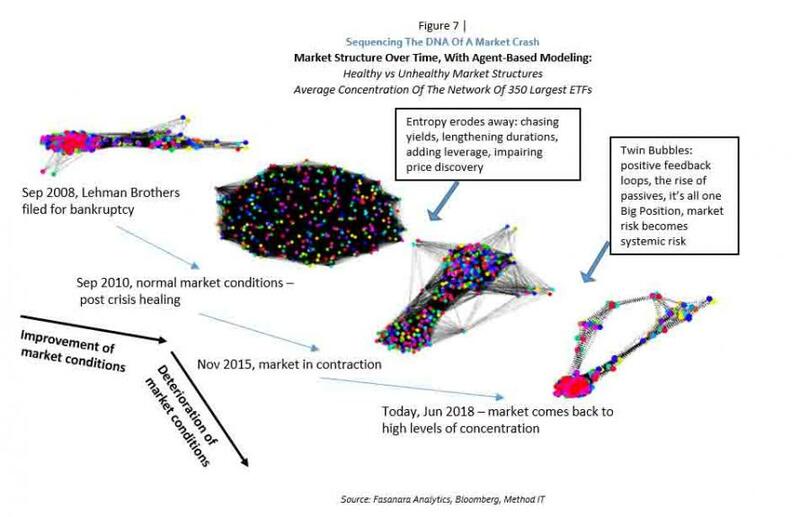 We analyzed the structure of the market network during good and bad times, trying to identify the DNA of a market crash. The current market exhibits the typical structure visible during flash crashes, yet despite not being in one. We conclude that the market system is full, stationing on paper-thin ice, ready to transition. The analysis is powered by our Fasanara Analytics team, a proud addition to the Fasanara family of late. It is not intended to be a finished product, but rather a work-in-progress, a live project on systemic risk as a complexity problem, which forms the conceptual framework around our ‘Fat Tail Risk Hedging Programs’. Looking forward to any feedback/support in taking this analysis further ahead.